Are you feeling unproductive and flustered at work? Do you feel like you don’t know where anything is on your desk? Are you losing track of meeting notes, project plans and more? If you are wondering how to organize your desk office or cubicle at work and are overwhelmed, then you’re in good company. The first step in learning how to declutter your workspace is to start with the necessities. Identify the items you use routinely and keep those item with a hand’s reach. Everything else should go into the trash, a drawer or some other space on your desk. This first step will keep you organized and focused on the task at hand. It’s terrific that you pack your lunch and bring it to work — but you don’t need to work through your lunch. Become a better employee by decluttering your desk of unnecessary plates, forks, storage containers and food. Instead, take your lunch outside and eat with some co-workers at a patio table. Go to the work room break table and eat. Go anywhere to eat your lunch but your desk. What happens when you take a break during the day is a miracle-worker for the overworked employee. Research shows that employees who take a break from their desks during the day come back with renewed energy and creativity for the tasks at hand. If you plan your day well, everyone can afford at least 20 minutes away from their desk to eat lunch. You’ll free your desk from food clutter in the workplace and renew your mind for the busy afternoon ahead. One of the best ways to declutter and get organized in your workspace is to free it from needless paper and email. You need to trash both paper copies and items you don’t need piling up on your desk and digital file that are just taking up space on your computer or in your email inbox. By approaching each file or paper with a sense of urgency to trash it if you do not really need it, you are creating a freeing environment that not only helps you feel more free and empowered but actually makes you more organized. There will be less to sift through (i.e. waste time looking and searching) and more time focused on the project you really need to complete or that deadline you need to meet. Finally, don’t forget to give your desk a good professional cleaning after you’ve followed these four easy tips. Use disinfectant wipes to remove dirt and spills. Clean your keyboard with an air gun made for keyboards and wipe down your computer monitor with a special screen cleaner and cloth. Dust, empty your trash can and vacuum your computer chair. A final cleaning is the last step in the process and will make you feel more refreshed and ready to start your work day! Are You Ready to Change Your Work Attitude? 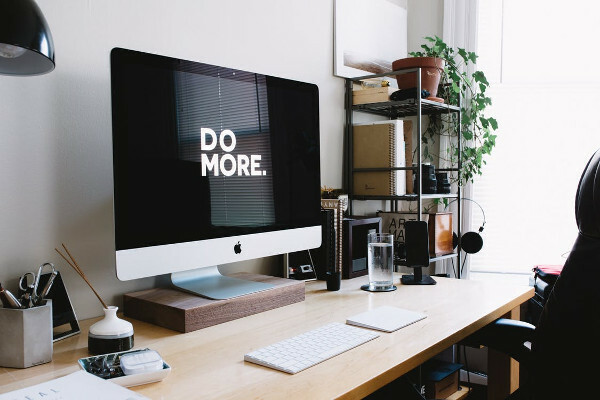 It starts in your workspace, and you can get the results you want simply by decluttering your space and tidying it up. What happens when you clean your cube is that it re-orients your mindset. Psychologically, you feel more put together and in fact, your workspace is more put together. You can find what you need when you need it. A new work landscape can do wonders for boosting productivity, creativity and your mood. So implement these four expert tips today! Riya is an inspired writer, passionate about traveling, lifestyle and encouraging startups. With spending her years in business administration, she understands the importance of productivity at work. Riya never stopped finding new ways to create her work productivity. Follow Riya on Twitter.